We offer top manufactured products to help aid your pool for proper water balance. Get rid of the phosphates by adding one of the fine products below. If you are an owner, or just a user of a swimming pool, there is no doubt that you would prefer one that is clean to a dirty one. Apart from being unsightly there is the concern that the water that you will be swimming in may not be sanitary. The use of filters is one way of keeping swimming pools clean but this alone is not enough. Arguably just as important, if not more so, is the role of pool chemicals. Unknown to many persons, there are a lot of factors involved in getting the water in swimming pools into the clean, crystal clear and natural looking condition that we have become accustomed to. Among the unsung heroes working behind the scenes are pool chemicals, of which there are quite a few. These include pool algaecides, pool balancers, pool sanitizers, pool shocks, and specialty chemicals. We will now briefly examine a few of these. Pool algaecides are specially formulated pool chemicals, which kill and prevent the growth and spread of algae. Usually unnoticeable when they first appear because of their microscopic size, algae can create problems if their growth gets out of hand. If allowed to get out of control its elimination can prove costly not only financially but also in time. Discoloring your pool water, sticking to pool surfaces, and blocking your filters, are just some of the ways that they cause inconvenience. Also among the pool chemicals arsenal are what are known as balancing chemicals. As their name suggests they provide balance between a number of different factors in the pool. The swimming pool water’s alkalinity, pH, hardness, stabilizer and chlorine levels are all impacted by it. On the face of it not having your swimming pool water balanced may not seem such a big deal but it can cause irritation of the eyes and skin, cause the water in the swimming pool to get cloudy, and cause other pool chemicals to function improperly. 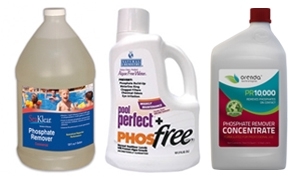 Another of the pool chemicals considered vital to the proper maintenance of swimming pools are pool sanitizers. Somewhat similar in function to algaecides, pool sanitizers attack and eliminate undesirable micro-organisms such as bacteria. There are quite a few pool sanitizers out there, among them ions, salt, and mineral, but the two most commonly used are chlorine and bromine sanitizers. Pool shocks are pool chemicals, which when introduced into swimming pools have the effect of sending a strong jolt through, or “shocking” the water. What actually happens is that the water in the swimming pool is super oxidized or super chlorinated with high levels of sanitizer. This kills anything organic in the water that the sanitizers and algaecides initially used may have missed. There is a set of special chemicals that is designed to do cleaning work like clean cartridges, remove stains, remove oils, and remove trace metals from fill water. These types of pool chemicals are known as specialty chemicals. While some specialty chemicals are used only when needed, as in the case of stain removal, others have been adopted as part of regular swimming pool water maintenance. As can be seen from the foregoing, pool chemicals have an integral part to play in ensuring that your swimming pool is indeed a pleasure to swim in. It would be a good idea too to have a water testing kit handy.